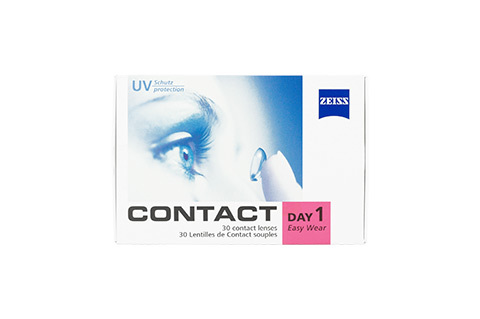 Contact Day 1 Easy Wear contact lenses are high quality soft daily lenses from the German contact lens manufacturer Wöhlk. In contrast to monthly or yearly lenses, daily lenses are thrown away once they have been used. The next time you want to wear lenses, you simply take a new pair out of the package. The blister packaging is both practical and hygienic. Single-use daily lenses are ideal for contact lens wearers with sensitive eyes, allergies, and those who only want to wear contact lenses occasionally, like when playing sport or on a night out. The material methafilcon A is also gentle on sensitive eyes. In addition, with daily lenses you are spared from the hassle of cleaning solutions and lens cases. The revolutionary aspherical lens design of the Contact Day 1 Easy Wear contact lenses improves the channelling of light onto the retina, resulting in sharper, crystal clear vision. The aspherical shape can even correct mild astigmatism up to approximately -0.75D. Mister Spex advises all online purchasers of Contact Day 1 Easy Wear contact lenses: the contact lenses, Contact Day 1 Easy Wear, should always be fitted to your eyes by an eye doctor or optician. The period between fittings, unless otherwise prescribed by an eye doctor or optician, should not exceed 6 months. You should go for regular check-ups. The manufacturer Wöhlk/your eye doctor/optician's recommended wearing time for Contact Day 1 Easy Wear contact lenses should be followed strictly. It is your own personal responsibility to make yourself aware of the care instructions for Contact Day 1 Easy Wear contact lenses and to follow them accordingly. In case of eye irritation or visual impairments when wearing Contact Day 1 Easy Wear, remove the contact lenses immediately and consult an eye doctor or optician. Damaged contact lenses should be replaced immediately.